18B - What Does a Special Forces Weapons Sergeant Do? 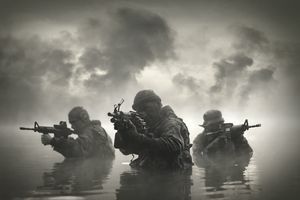 The special operations weapons sergeant employs conventional and unconventional warfare tactics and techniques in individual and small unit infantry operations. Trains and maintains proficiency in all Major Duties- Employs highly demanding conventional and high-risk unconventional warfare tactics and techniques in the employment of individual domestic, foreign small arms, light and heavy crew-served weapons, anti-aircraft and anti-armor weapons. Supervises and performs construction of hasty fortifications and controls execution of tactical conventional and unconventional operational employment and functioning of all types of U.S. light weapons (up to and including 50 cal MG), U.S. heavy weapons (up to and including the 4.2in and 120mm mortar and 106mm RR), man-portable air defense weapons and U.S. antiarmor weapons (including anti-tank missile systems), to perform tactical operations. Maintains proficiency with the employment and functions of all foreign high-density light and heavy weapons, man-portable air defense and anti-armor weapons. Evaluates terrain selects weapons emplacements, sites, and assigns targets and areas of fire. Reads, interprets and prepares combat orders. Proficiency in all major duties. Employs highly demanding conventional and high-risk un-conventional warfare tactics and techniques in the employment of individual domestic, foreign small arms, light and heavy crew-served weapons, anti-aircraft and anti-armor weapons. Supervises and performs construction of hasty fortifications and controls execution of tactical conventional and unconventional operational employment and functioning of all types of U.S. light weapons (up to and including 50 cal MG), U.S. heavy weapons (up to and including the 4.2in and 120mm mortar and 106mm RR), man-portable air defense weapons and U.S. anti-armor weapons (including anti-tank missile systems), to perform tactical operations. Maintains proficiency with the employment and functions of all foreign high-density light and heavy weapons, man-portable air defense and anti-armor weapons. Evaluates terrain selects weapons emplacements, sites, and assigns targets and areas of fire. Reads interprets and prepares combat orders. There is no civilian occupation that is directly equivalent to MOS 18B. However, security guards make use of the skills developed through MOS 18B training and experience.